Charlton Weir Pool: The road to, and access at this site is good and can be accessed in a 2WD vehicle in any weather conditions. 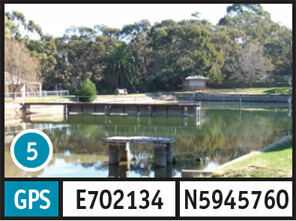 A concrete boat ramp can be accessed in a 2WD vehicle in any weather condition. The bank slope is steep and access to the water is easy to moderate. The only facility available is a Picnic Table. The turn off to this site is located 41.8km North of St Arnaud along the Charlton St Arnaud road. 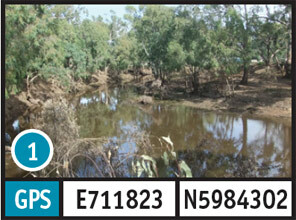 Take High Street for 500m, followed by Mildura Way for 700m and then an unnamed road for 600m to reach this site. 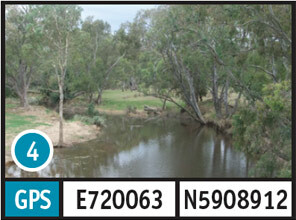 Yawong Weir: The road to this site is 2WD in any weather conditions. Access and parking is only suitable in a 2WD in dry weather conditions. The bank slope is moderate to steep and access to the water is good. There are no facilities available. The turn off is located 21.5km North of St Arnaud along the Charlton St Arnaud road. You will then need to take an unnamed road for 700m to reach this site. Gowar East Bridge: The road to, and parking at this site is good and can be accessed in a 2WD vehicle in all weather conditions. The bank slope is moderate and access to the water is good. The only facilities available are picnic tables Camping is permitted. 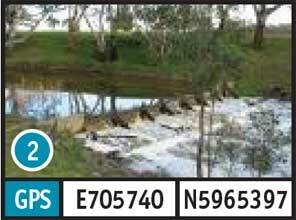 The turn off to this site is located 5.2km East of St Arnaud along the Wimmera Highway. Then take the Wedderburn Road for 12.2km to reach the site. Natte Yallock: The road to, and parking at this site is good and can be accessed in a 2WD vehicle in any weather conditions. The bank slope is moderate to steep and access to the water is moderate. There are no facilities available at this site. The turn off to is located 32km South of St Arnaud along the Sunraysia Highway. 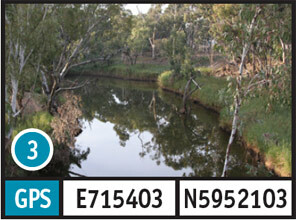 Take the Maryborough-St Arnaud Road for 15.2km, followed by River Bend Road for 200m. Old St Arnaud Swimming Pool: The access to the swimming pool is an all weather road. The bank slope is steep and access is via a jetty. There are picnic facilities in the adjoining park. From Napier Street, follow Alma Street to the pool area.